This LO is of Shawn's new truck that he got last weekend. He has wanted a yellow vehicle the entire time we have been married. This truck is a brand new, 2008 Dodge, 1500, 5.7 liter Hemi with a lift kit, and more options than anyone should have at their disposal. He loves it and we got the best deal we ever have on a vehicle deal, so I am happy. 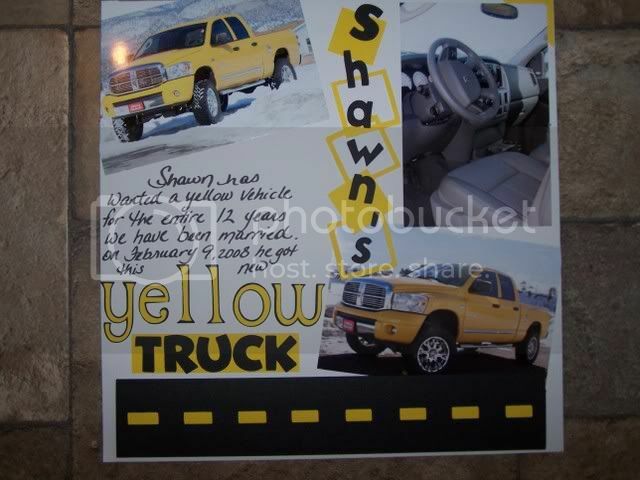 Here is the funny part though; a week before Shawn found this truck he came in my scrap room and looked around. He asked, "How much money do you have in scrapbook supplies?" I replied, "Hmmm, let's see. ATV, ATV, boat, camper, ATV, ATV, boat, motorcylce and camper." I have about an ATV worth at most. Shawn replied, "Point taken!" So I guess he is yet another one up on me! Oh well, he is happy and I am happy, that is what matters. My husband had a truck just like this until a few months ago. He sold it for a newer Dodge that was a diesel engine. Not sure why we needed the diesel, but it is his thing, so I don't really care. It was kind of nice with the yellow truck if peopl were looking for our house, I would just tell them turn on my street and look for the yellow truck, lol.